expectations at all ages of their wives. 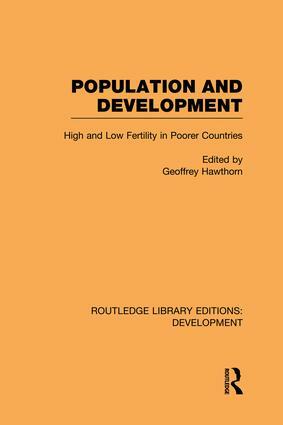 The large proportion of wives who prefer to have as many children as possible or who want God to determine their fertility (29 per cent) substantiates the traditional belief among the people that God alone has supremacy over all procreation. Far from the suggestion that these women may not have given any real thought to their ideal family size, the large-scale unwillingness to cease child-bearing even when five children are surviving at the end of reproduction is indicative of the intensity of the pro-natalism of the Ngwa Igbo wife. If the Ngwa Igbo wife is pro-natalist, her husband is even more intensely so. At every age group of their wives, the Ngwa Igbo husbands prefer, at least, two or more children more than their wives. Their preferences might even be higher if those who prefer as many children as possible (51–5 per cent) are taken into account. The preference of husbands might appear to be suspect because this information was not obtained directly from them. However, when we control for persons present during interviews in Table 2, the difference between the preferences of husbands who were absent during interviews and that of those who were present does not reach significance at the 99 per cent level (compare 8.2 and 8.0 respectively). As would be expected, the wives answering for their absent husbands were more likely to give non-numerical responses than those whose husbands were present during the interviews (61 per cent and 42 per cent respectively). Even then, it is important to note that over two-fifths of all husbands who were present during the interviews wanted to have as many as possible in a culture where the pattern of family organisation is predominantly authoritarian. By[Swartz, 1969], rural Ghana [Caldwell, 1968], and in western Nigeria [Ware, 1975]. would consider six children to be too many: but only 14 per cent of the Ngwa Igbo wives of eastern Nigeria would consider six or seven children to be too many. Again, whereas 80 per cent of the former would reject ten children, only 36 per cent of the latter would do so. The dissimilarity in perceptions of acceptable family size in the two cultures is not only the consequence of differences in educational, occupational, and residential characteristics of the areas under study, but also the result of the differential emphasis which the different traditions place upon a large family. For example, whereas the Yoruba would recognise that 'Omo beere, osi beeri' ('Lots of children, lots of misery'), the Ngwa Igbo would tend to gloss over the 'misery' aspect of numerous children and then to recognise the 'utilitarian' aspect by saying Uba di ire bu umu' (i.e., True wealth means children') . In actual practice, the Ngwa Igbo wives tend to report higher parities than the Yoruba wives, the effect of child mortality notwithstanding. Thirty per cent of the Ngwa Igbo wives aged over forty years reported parities of nine or more children while only 11 per cent of the Yoruba wives in similar age group reported nine or more children. Again, 20 per cent of the former wives aged over forty years had ten or more children compared to only 6 per cent of the latter. These differences are large enough to indicate the differences in the values attached to large families in the two cultures. Probably the underlying influences which determine the rejection of the small family of three or less children lie well outside those investigated in Table 6. The evidence from this table shows that there are no significant differentials in the attitudes of wives by their education, nor by their husbands' education, nor even by the number of children surviving to the wives in Ngwa Igbo. Nevertheless, the wives, who might tend to reject fewer than three children are only those who have no surviving child, those whose ideal number of children was under eight, and those in monogamous unions. However, the differences between their average preferences and the sample average do not reach significance at the 99 per cent level. As in the case of the upper limit of acceptable family size, the rejection of the small family size of less than four children is the consequence of the prevalence of high parity in Ngwa Igbo. For example, only about six per cent of the wives aged 40–44 years reported three or less children in their achieved family size. This pattern is true of all wives, only about seven per cent having reported a completed family size of one or two children. The ideas of Ngwa Igbo wives in respect of the small or undesirable family size, ideal family size, and the too many or undesirable family size—probably reflect their life long experiences in child-bearing. The reasons for the rejection of the small family of two or three children is probably connected with those favouring a large family and resulting in a large-scale reluctance to cease child-bearing. Nigerian women, their proportion wanting to halt child-bearing is merely half of the proportion obtainable in Asian countries, indicating the greater traditionalism of the Nigerian women in respect of the fertility ideal. Where the preferences of wives and their husbands reflect real convic-tions, such attitude can only result in keeping fertility very high rather than causing any appreciable reductions. However, the indication that some women would accept a moderate family size of four to six children underlines the necessity to motivate a significant proportion of the women to accept the moderate family ideal. For such a motivation to be meaningful and fruitful, it must take into account the concern of the women for the number of their children who would be likely to survive them. The conditions which require to be taken under control include, inter alia: (i) a substantial reduction in the incidence of infant and child mortality; (ii) action programmes to motivate women to want a moderate family size of four, five or six children, and also to help those who would regret additional children to carry through their desires. There is no doubt that one of the major impediments against the low level of contraceptive use among the Ngwa Igbo wives [Ukaegbu, 1977] is a lack of desire to cease child-bearing long before their last child is born. Even if a family planning clinic were available free of charge and within reach of all the women, the wives who want more children would be less likely to use such a service to the best advantage until they have countered the possible or imaginary effects of child mortality and /or until they have radically modified their beliefs about the value of the large family.